On Friday Sept 28, 2018 a presentation was made on the proposed Boundary Integrated Watershed Management Service Proposal which comes up for referendum voting next month. This presentation was at Christina Lake – there will be another in Grand Forks in the coming week, on Thursday Oct 4 at 5PM at GFSS before the Mayoral Debate. Along with the recording we have some of the handouts in PDF form as well. Thanks to Thomas Reichelt for the ride and taking a hand at the camera. This entry was posted in government and tagged kettle River, management, plan, Service, Thomas Reichelt, watershed on October 1, 2018 by gftvboss. Or CLWMP for short, is happening today Dec 3 at the Community Hall in Christina Lake. For the past few years I’ve recorded it for their archives … this year I’m also broadcasting it live. And you can watch it below. This entry was posted in Christina Lake, West Kootenays and tagged Christina Lake, plan, watershed on December 3, 2014 by gftvboss. 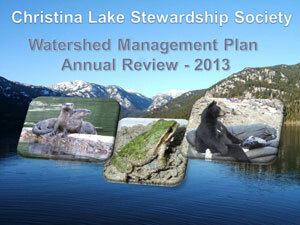 In December 2013 the Christina Lake Stewardship Society held their annual review of their Watershed Management Plan. This brought together local people and managers of the various programs involved in being proper stewards of the watershed within which Christina Lake finds itself. Management of the watershed entails more than ‘water’. BC Timber Sales had a rep there to explain their plans for local operations and to answer questions. The Ministry of Environment appeared twice: Once for a Water Quality Report and again for a report on Invasive Species Regulations. Invasive Species is a big thing in this whole scheme – it appears three times: Provincial, Area (Boundary) and Local. Locally they’re monitoring to try and keep the Zebra and Quagga Mussels out so they do not become a problem on the scale of Millfoil. This happened over a day of presentations and Question and Answer sessions. You can watch the proceedings below. This entry was posted in Boundary, Whats Up In GF and tagged Christina Lake, plan, water, watershed on June 13, 2014 by gftvboss.